Line two 15-in. x 10-in. x 1-in. baking pans with waxed paper. Prepare one cake mix according to package directions; pour into one prepared pan. Repeat with remaining cake mix. Bake at 350° for 20-25 minutes or until a toothpick inserted near the center comes out clean. Cool for 5 minutes before removing to wire racks to cool completely. Gently peel waxed paper from cakes. Trim tops to level cake. Place one large cake layer on a 16-in. x 12-in. covered board. Frost top with 1/3 cup white frosting; top with second large layer. Frost top and sides white. Top with one medium cake layer; frost top with 1/3 cup white frosting. Top with remaining medium layer; frost top and sides red. Top with small cake layer; spread top with white frosting. Top with remaining small layer; frost top and sides white. For ribbon, cut one fruit roll into a 19-in. long strip; set aside remaining piece. Starting at the bottom short side of the cake, center fruit roll and drape over each layer, ending at bottom of opposite side. Cut another fruit roll into a 15-in. strip; set aside remaining piece. Repeat draping for the long side. For the bow, cut a 12-in. and 3-in. strip from a reserved fruit strip. Loop each end of the 12-in. strip toward center; pinch together to seal. With the 3-in. strip, form a circle. Place in center of bow and press to hold. Place on cake. Insert 1-1/4-in. foil balls inside bow loops and a 3/4-in. foil ball inside center loop to hold open. Cut the remaining fruit strip into four 3-1/2-in. strips; cut a "V" in one end of each. Tuck straight ends under base of bow. 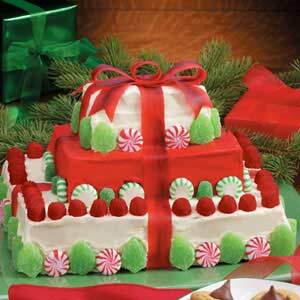 Decorate cake with candies. Remove foil balls just before serving. Makes 12-14 servings.